Wanna know what we offer? 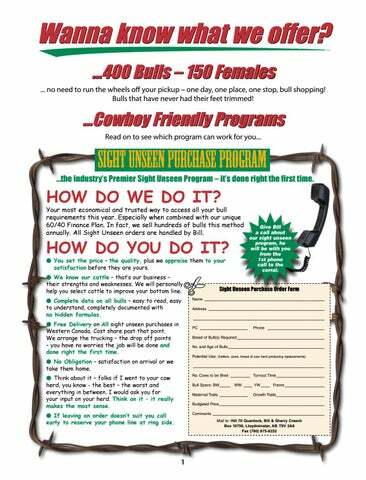 ...400 Bulls – 150 Females ... no need to run the wheels off your pickup – one day, one place, one stop, bull shopping! Bulls that have never had their feet trimmed! 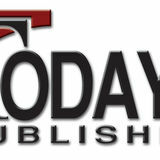 …the industry’s Premier Sight Unseen Program – it’s done right the first time. Your most economical and trusted way to access all your bull requirements this year. Especially when combined with our unique 60/40 Finance Plan. In fact, we sell hundreds of bulls this method annually. All Sight Unseen orders are handled by Bill. How do you do it? ●	You set the price – the quality, plus we appraise them to your satisfaction before they are yours. ●	We know our cattle – that’s our business – their strengths and weaknesses. We will personally help you select cattle to improve your bottom line. ●	Complete data on all bulls – easy to read, easy to understand, completely documented with no hidden formulas. ●	Free Delivery on All sight unseen purchases in Western Canada. Cost share past that point. We arrange the trucking – the drop off points – you have no worries the job will be done and done right the first time. ●	No Obligation – satisfaction on arrival or we take them home. ●	Think about it – folks if I went to your cow herd, you know - the best – the worst and everything in between. I would ask you for your input on your herd. Think on it – it really makes the most sense. ●	If leaving an order doesn’t suit you call early to reserve your phone line at ring side. Give Bill a call about our sight unseen program, he will be with you from the 1st phone call to the corral.